Home / About Energy Drinks / Advocare Spark Review – Does Spark Energy Drink Work? Advocare Spark Review – Does Spark Energy Drink Work? Reading an Advocare Spark review or two is a smart idea before taking the plunge and buying some yourself. Is Spark any good? What does Advocare Spark taste like? How is the energy boost? What are the after effects? Is it worth the money? We tackle these questions and more in this Advocare Spark review to help you make a more informed decision, but ultimately, it's up to you to decide if Spark is the best drink for you. Before we dive in to this Advocare Spark review, the bottom line (spoiler alert) is that Advocare Spark is pretty darn good. Maybe even worthy to be considered one of the best energy drinks, but I'll let you make a call on that after reading the rest of this article. There are a few issues that we will cover one by one as we go, but I am a fan of the product and that was part of the reason for doing my own Advocare Spark energy drink review article. Like Zipfizz, Gfuel and REIZE, Advocare Spark is a powder energy drink that you mix with water, however REIZE costs considerably less than the others. You can buy Advocare Spark online and have it shipped to your door. It's available in larger tubs or smaller, single-serve sachets. Each sachet of Advocare Spark makes a single serving of energy drink. After some searching online I bought a 14-pack of mango strawberry Advocare Spark on Amazon. The total price was $30.73, which comes out to $2.20 per drink. I was hoping to find a reasonable price for a mix of flavors, but I couldn’t find anything. There were some more expensive options, but just to try it for the first time, $30.73 seemed like enough to be spending. I figured that if I liked it after doing this Advocare Spark review I could decide to buy more, but I'm still getting through my initial purchase. I live on the east coast and it took about a week for my Advocare Spark to arrive at my door. I’m not sure why it took that long, but usually when I shop on Amazon things arrive much faster. Maybe they just didn’t get around to shipping my order for a few days, but as a result, my shipment was slow to arrive. I was a bit surprised to see the packaging that my Spark drinks arrived in. They arrived as a fistful of loose sachets inside a generic polystyrene box. The nice-looking packaging that I saw on the Amazon listing wasn’t included, consequently, I was left with a handful of loose sachets and some ugly polystyrene. I can understand that perhaps they want to save some money on shipping, but if that’s the case, why did they bother including the big, bulky polystyrene packaging? It was about the same size as the original box would have been. It would make some sense to me if they just sent all 14 of the sachets loose inside a smaller box, but they don’t seem to have saved themselves any size at all by switching to the ugly, generic polystyrene packaging. Where did the nice looking box that I saw online go? If we didn’t talk about the ingredients this wouldn’t be a well-rounded Advocare Spark review, so let’s cover them now. The Spark packaging has quite a long list of ingredients. Each stick pack contains a quarter ounce of dry powder. The idea is that you should mix the powder with 8 ounces of cold water. *RDV = recommended daily value. The packaging mentions that the percentage of the total recommended daily value is based on a 2,000-calorie diet. I was wondering why they didn’t mention the daily value for some of the ingredients and I found some interesting information. In fact, most of these ingredients that are listed without specifying the percentage of the recommended daily values are ingredients that are found in extremely small quantities. Could it be that these “nice sounding” ingredients were included in very small quantities purely for marketing purposes? Vitamin & amino acid supplement? I wanted to dive deeper into the “Vitamin & amino acid supplement” claims that are printed in large font on the Spark drink packaging in this Advocare Spark review. I’ll cover vitamins and amino acids separately to keep things simple. First, I'll cover the crazy-high amount of vitamins, then we'll look at the embarrassingly low amount of amino acids. Look at those big, bold letters. Spark must be loaded with amino acids, right? When looking at the list of Spark ingredients, do you notice that many of them are way above the recommended daily values? In fact, there are 7 different ingredients that are ALL at least double the recommended daily values. But, some are much higher than double what we need. This might sound great for a moment, but these vitamins are water-soluble. What does that mean? It means that our bodies don’t store extras for tomorrow or next week, instead, anything surplus to requirements gets flushed down the toilet. Have you ever noticed that your pee is bright yellow after you drink an energy drink? Yep, it happens to all of us. It’s because of the really high number of B vitamins. Our bodies can’t hold them. We take what we need, but the rest goes out with the next flush of the toilet. So… don’t get too excited about Advocare Spark including 7 different vitamins in crazy high quantities, besides, who wants 750% of the recommended daily dose anyway? All of those surplus vitamins don’t actually help us at all, despite sounding more healthy. Here’s where things really get interesting with the Advocare Spark ingredients. While they openly and proudly boast about having so many useless vitamins that we flush down the toilet, but the really good stuff is included in such tiny amounts that it might as well not be included in a Advocare Spark review at all. If you’ve never hear of a “clinically effective dose” before, it’s scientist-speak for the minimum amount of something that you need to take before you get any of the benefits from taking it. If you don’t have enough to reach the clinically effective dose, you won’t be getting any of the advertised benefits of whatever ingredient it is. The amino acids included in Spark energy drink are great. No question about it. L-tyrosine is great for its stress-fighting qualities, Glycine helps us get a good nights’ sleep and L-Carnitine helps us to burn fat and it slows the ageing process. But what are the minimum effective doses of each of these? And how do the minimum requirements compare to the amount of each actually found in a serving of Advocare Spark energy drink? Is there sufficient L-tyrosine in Advocare Spark? To get any positive effects from L-tyrosine we need to consume somewhere around 50-70mg for each one pound of body weight. That means that a 180-pound person should consume around 9-13 grams of L-tyrosine to benefit from its stress-fighting promise. Advocare Spark energy drink contains just half of one gram of L-tyrosine. That’s around 5% of the amount that we would need to consume to reach the threshold where we get any benefits from consuming L-tyrosine. Is there sufficient Glycine in Advocare Spark? Next, we have Glycine. The scientific community agrees that 3 grams of glycine consumed one hour before bed is enough to enjoy the benefits of a better nights’ sleep. Advocare Spark ingredients include only 100mg of glycine. That’s around 3% of the amount of glycine that we would need to consume to get the benefits that it promises. Is there sufficient L-Carnitine in Advocare Spark? Third, there’s some L-Carnitine in Advocare Spark. However, I use the word “some” loosely, as you’re about to find out. L-Carnitine is great. It helps to reduce the effects of ageing and it also helps us to burn fat. It’s good stuff. The problem is, to get these awesome health benefits, we need to be consuming somewhere around 500mg to 2 grams of L-Carnitine. How much L-Carnitine is in Advocare Spark drink? Why did they even bother including it as an ingredient at all? With such little L-Carnitine present in Spark drink, there’s between 0.5% and 2% of the amount required to reach a minimum effective dose. Advocare Spark energy drink contains only a VERY small amount of amino acids. Look, I don’t really care if Advocare Spark contains enough of these ingredients or not. I still think it’s a good drink. But, I wish they would stop shouting about how healthy Spark drink is, because it's misleading. The surplus vitamins are completely wasted and the amounts of amino acids are too small to get any benefit from, despite the large font on their packaging proclaiming the inclusion of these amino acids. I think we can all guess why Advocare list these ingredients so proudly. Either that or we can assume that vitamins are cheap to include in super-high quantities and amino acids are expensive to include in meaningful quantities. But let's be real, it's probably just for marketing. 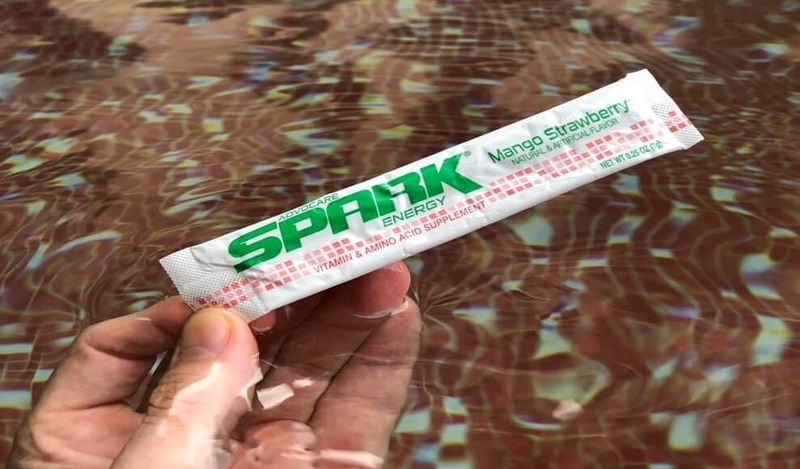 This Advocare Spark review is all about mango strawberry flavor, however there are 9 other flavors available. Mango strawberry seemed to be quite a popular flavor, so I wanted to try it for myself. It’s sweet, but well balanced. Not overly sweet or sickly medicine tasting. It almost tastes thirst-quenching. The mango and the strawberry are subtle, but together the flavors work well. They definitely taste artificial though, it doesn’t taste like a real fruit flavor at all. Advocare Spark energy drink gets a lot of criticism for not mixing well. The sachet is easy to open, but you might find that you spill some of the powder because of the way the sachet comes apart. I found as I was pouring the powder quite a lot of it was hitting the opened corner and missing my cup. It’s probably a good idea to put the open part of the sachet completely into the glass, beneath the brim and give it a good shake. That should do the trick. Advocare Spark mango strawberry energy powder. After pouring in the recommended 8 ounces of cold water the mixing process seemed to happen quickly, however, there was no fizz and no bubbles. It seems kind of weird for an energy drink to be non-carbonated. Perhaps that’s part of the reason that Spark drink doesn’t mix very well. The top of the drink looked like it had a thin “skin” of undissolved powder, however it didn’t look very appealing at all. But hey, the first few sips tasted great. A freshly mixed Advocare Spark mango strawberry energy drink. When I got to the last mouthful or two in the bottom of the glass I could see quite a lot of powder sitting at the bottom of the glass, still undissolved. I gave it plenty of time to mix too, from pouring the drink to finishing the drink was around 10 minutes. The undissolved powder at the bottom of the glass made the last mouthful taste pretty horrible. There were little grains of powder in my last sip that weren’t very pleasant. Undissolved Advocare Spark powder at the bottom of my glass. With 120mg of caffeine per stick, Advocare Spark will give you a good energy boost. I felt a gentle boost after about 30 minutes that seemed like it lasted for a few hours before I noticed that my energy levels weren’t as high as they were anymore. Some people talk about a crash or feeling sick after drinking Advocare Spark, but I didn’t experience that. Perhaps I had a slight dip in energy, but nothing significant like you get from some other sugar-filled energy drinks. I did feel a little bit unwell in my stomache after about 3 hours though and I felt really thirsty for the rest of the afternoon. I literally couldn’t drink enough water to quench my thirst. What are people saying about Advocare Spark? There are a wide variety of Advocare Spark reviews online. Some people swear by it and others think it’s terrible. Personally, I don’t feel strongly either way. I think it tastes good and gives a nice, gentle energy boost. It is a touch on the expensive side of things though. Especially compared to REIZE. But… I didn’t feel fantastic later in the afternoon and I did need to drink a ridiculous amount of water to quench my thirst. I guess you’ve gotta take the good with the bad. Nevertheless, most Advocare Spark reviews seem to be positive. This Advocare Spark review was positive. There are also completely different caffeinated categories, such as Mio or caffeine pills that are worth checking out. But, remember to always consume energy drinks in moderation to avoid any potential health issues. Advocare Spark energy drink is good. I only tried mango strawberry flavor, but I liked it. The energy boost worked for me, but there were a couple of unpleasant after-effects that took away from the experience of the drink overall. I’m giving Advocare Spark energy drink a 7/10 for my unofficial Advocare Spark review. I’ve deducted a point for the poor mixing of the powder, another point for how thirsty I was after drinking it and a final point for the hideous packaging that they sent it to me in. For $2.20 per drink they can do better. I feel like a 7/10 might be a bit generous, and I’m tempted to deduct another point for their bragging about being a “Vitamin and & amino acid supplement”. I’ll let you be the judge of that one. All I’ll say is that the extra vitamins go straight out in our wee and the amino acids are found in such small amounts that they might as well not be included in the Advocare Spark ingredients at all. I hope this Advocare Spark review was helpful. To see how Spark compares to another very popular energy drink powder, check out my Zipfizz review. If you are interested in trying another powder energy drink mix that I give 10/10, then you might want to have a look at REIZE energy drink. REIZE ships to your door for around $1 per drink. That’s less than half the price of Advocare Spark. It also has less calories than Spark and tastes amazing. I'm not even biased. OK, maybe I am. REIZE is the smarter choice if you’re looking for a great energy drink.